Effective search marketing requires a strategic approach and the right tactics. Many marketers have found their efforts to drive leads from their website to be less fruitful than they would like. Others who have mastered these techniques are trying hard to keep up with the volume of inbound marketing leads. We have applied these techniques for our clients and have generated over 1000 new leads for our Global customers. 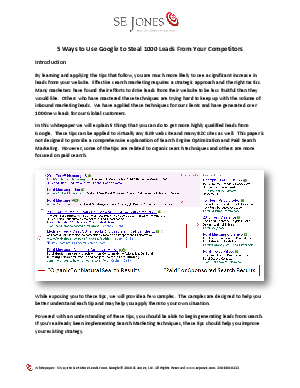 In this whitepaper we will explain 5 things that you can do to get more highly qualified leads from Google. These tips can be applied to virtually any B2B web site and many B2C sites as well. While exposing you to these tips, we will provide a few samples. The samples are designed to help you better understand each tip and may help you apply them to your own situation. Powered with an understanding of these tips, you should be able to begin generating leads from search. If you've already been implementing Search Marketing techniques, these tips should help you improve your existing strategy.